AleaSoft, January 17, 2019. A new cold snap is expected to hit the European continent later this week and next week especially in its central part, although the drop in temperatures will also be noticed in the Iberian Peninsula. 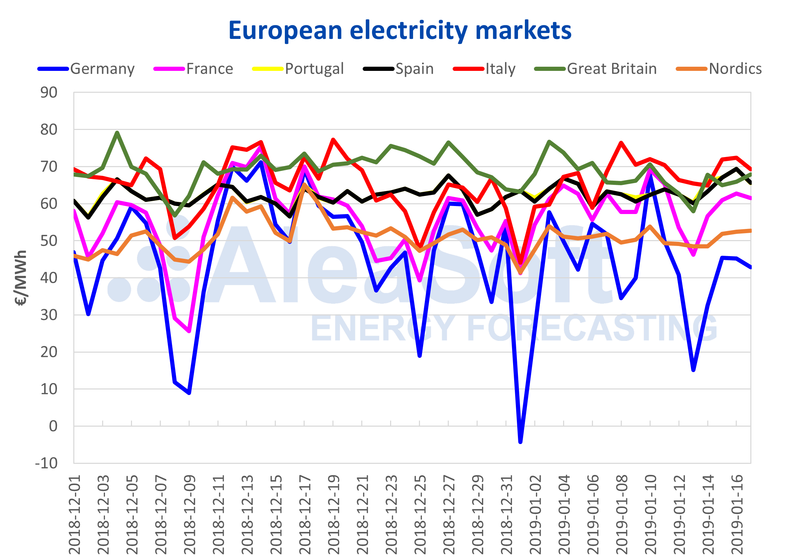 The expected increase in demand, together with moderate wind energy production, will push prices higher, mainly in electricity markets that are more sensitive to weather conditions, such as the French market. The price of the German electricity market has been the lowest among all the markets during the last seven days, even lower than the Nord Pool market of the Nordic countries, after the price peak on Wednesday, January 10, caused by the fall in wind energy production. Since last Friday, the wind energy production has come back and has allowed the German market to have the lowest price in the continent. 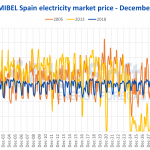 By contrast, the Iberian market MIBEL in Spain and Portugal suffered a significant decline in wind energy production this week of January 14, and recorded high prices during the week, with a maximum of 69.43 €/MWh on Wednesday 16, surpassed only by the Italian IPEX market with a price of 72.39 €/MWh. The British market has also been located in the high price band, with nuclear production at minimum and almost half of the plants stopped for maintenance, and a discreet wind energy production. The cold snap expected for the next few days in the European continent will lower the thermometers considerably. 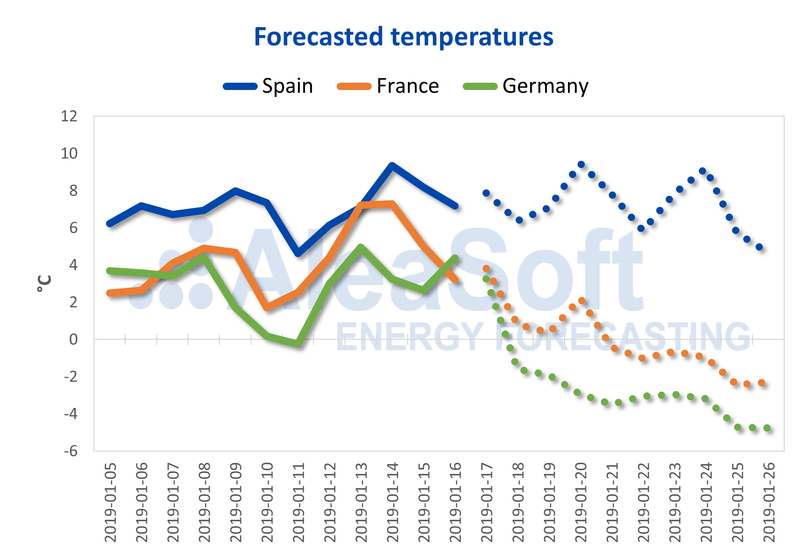 In France, temperatures will drop 5.5 °C the week of January 21 according to AleaSoft‘s forecasts, and more than 9 °C in Germany. In mainland Spain, the expected drop in temperatures is 2.5 °C. All this, also with a wind energy forecast that is currently moderate, will lead to price increases in the electricity markets. Sources: Prepared by AleaSoft with data from public sources. Electricity futures for the year 2020 are at the same level of the previous week, of January 7, but with a slight upward trend. Futures for Spain and Portugal increased by 0.5% this week, and 0.7% and 0.3% for France and Germany respectively. Yesterday, January 16, the very long-term futures of the OMIP market, from 2021 to 2026, experienced an important increase between 1.5% and 1.6%. The forecasted cold snap pushed up the price of fuels, gas and coal, this week. The futures price of API2 coal for February increased 1.2% compared to the previous week, while the futures of TTF gas were less affected and its rise was 0.2%. The price of EUA CO2 emission rights continues to be threatened by volatility and uncertainty after the British Parliament rejected the proposed Brexit agreement. During yesterday’s trading session, January 16, the price for the reference future contract for December rose by 3.4% and settled at 23.40 €/t, already exceeding the price recorded during the fall at the beginning of the year, but still far from returning over 25 €/t with which the year began. The futures of Brent oil fell slightly from the high of $61.68 per barrel reached on Thursday, January 10, and on Monday it settled at $58.99, due to the climate of doubt that surrounds the growth prospects of the global economy. Yesterday, January 16, it settled at $61.32, up 3.9% from the minimum on Monday, January 14. The electricity demand already recovered its usual behaviour after the holiday season and festivities. January 7 was the last atypical day due to being a holiday in some communities and still being in the school holiday period. For this week of January 14, demand will increase by 1.2% compared to the previous week, according to AleaSoft forecasts. 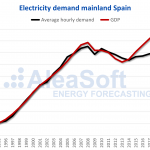 For next week, from January 21, during the cold snap, the increase in demand in Spain will be around 1.8%. The hydroelectric reserves were at 9878 GWh at the beginning of this week, 42.4% of the total capacity and more than 12% below the average of the last five years. Hydroelectric production has also been decreasing, 19.8% the week of January 7 compared to the previous week. Sources: Prepared by AleaSoft with data from REE. Wind energy production registered on Tuesday, January 15, and Wednesday, January 16, its lowest value of this year with 56 GWh and 60 GWh, respectively. In the global of the week, AleaSoft’s forecasts indicate a fall in production of 39.2% compared to the previous week. Solar production, which includes both photovoltaic and solar thermal, should have begun to rise from the seasonal minimum at the end of December as the hours of sunshine lengthen and solar radiation increases. 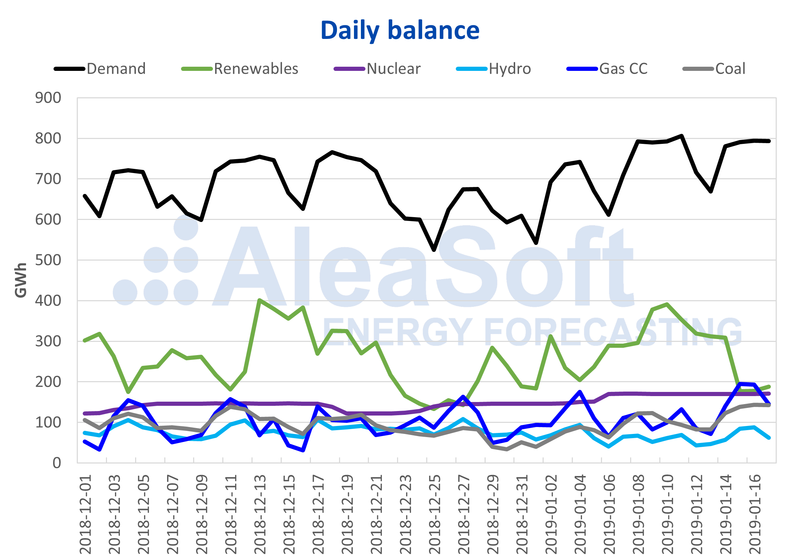 But for this week of January 14, AleaSoft forecasts point to a fall of 33.8%. The decrease of hydroelectric, wind and solar energy production together with the increase in demand resulted in an increase in thermal production with coal and, above all, gas combined cycles. The production of the combined cycles on Tuesday, January 15, was 195 GWh, a value not reached in all of 2018, and that we have to go back until the beginning of December 2017 to find such a higher one.